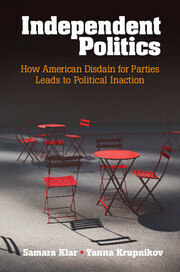 Yanna Krupnikov is the co-author of Independent Politics: How American Disdain for Parties Leads to Political Inaction (2016). She is an Assistant Professor of Political Science at State University of New York, Stony Brook. Her research focuses on the way political communication affects public opinion and the way people express their political opinions through political actions. Krupnikov's work has been published in numerous journals including the American Journal of Political Science, Political Behavior, and Political Communication, and has been supported by the National Science Foundation. She is the winner of the Midwest Political Science Association's Robert Durr Award and the award for the best paper by an emerging scholar. Krupnikov earned a PhD in Political Science from the University of Michigan and also holds degrees from the University of Toronto and Brandeis University, Massachusetts.